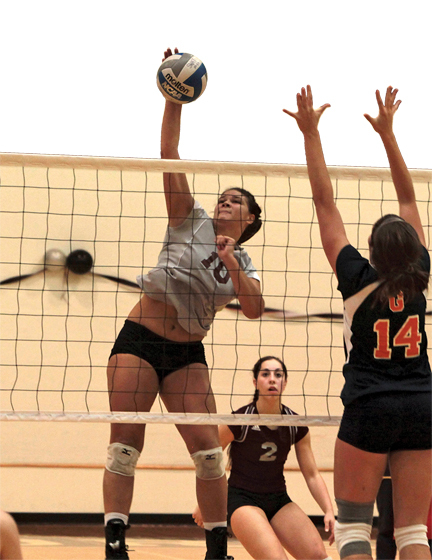 Kat Montemurro ’13 (above), who led the volleyball team in hitting percentage, was one of several Garnet volleyball players honored during the 2010 season. Head coach Harleigh Chwastyk was named Centennial Conference Coach of the Year for the second time. One year removed from surprising the Centennial Conference with a 19-win season and the program’s first playoff victory, Swarthmore’s volleyball team proved that last season was no fluke, winning a program-best 20 games, reaching the Centennial Conference Championship match for the first time in program history, and advancing to the ECAC South Region semifinals. The Garnet made it to the Centennial title match in dramatic fashion, rallying from down 2-1 to defeat arch-rival and four-time defending Conference champion Haverford 3-2 on its home court. Swarthmore eventually succumbed to Franklin & Marshall in the championship, 3-0, but still earned its second-consecutive bid to the ECAC South Region playoffs. 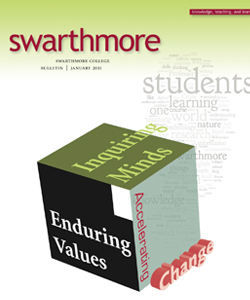 Swarthmore earned a No. 3 seed and hosted DeSales in the opening round of the ECAC playoffs, besting the Bulldogs 3-1 for the team’s 20th win before falling to Bethany College 3-2 in the semifinals to end the season. Other team highlights from the program’s remarkable year include capturing first place in both the Moravian Greyhound Premier and Garnet Classic, winning multiple Centennial Conference playoff games for the first time in program history, and defeating Gettysburg College for the first time ever. Several members of the team received honors and accolades. Genny Pezzola ’12 was named to the Centennial Conference first team for the second consecutive season and became just the third player in program history and first junior to reach 1,000 career kills and digs. Kat Montemurro ’13 and Hillary Santana ’12 were named to the second team after leading the Garnet in hitting percentage (.315) and digs per game (3.56) respectively. Allison Coleman ’13 was named to the ESPN/Cosida Academic All-District Team. Finally, head coach Harleigh Chwastyk received her second straight Centennial Conference Coach of the Year honor for her exceptional work in turning the program into a conference power. The awards keep rolling in for Morgan Langley ’11 (above). The Centennial Conference Player of the Year was also named to the NSCAA All-Region and All-America teams and an ECAC Division III South Region First Team All-Star. 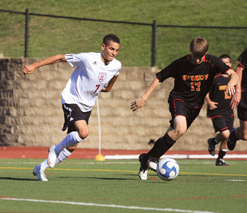 During his senior season, Langley led the team with 14 goals, 14 assists, and a record 42 points. A second Centennial Conference championship in three seasons, a program-record third-consecutive trip to the NCAA Tournament, and the program’s first No. 1 national ranking highlighted another sensational season for the Swarthmore men’s soccer team. Drawing more than 7,000 fans to Clothier Field during the season, the Garnet men didn’t disappoint the Swarthmore faithful, as the squad completed its second straight season unbeaten at home while developing a habit of dramatic last-second victories. Swarthmore remained unbeaten through its first 13 games of the season—besting quality opponents from Johns Hopkins, Dickinson, and Rensselaer—and on Oct. 19, reached the No. 1 ranking in the NSCAA National Coaches Poll for the first time in program history. After closing out the regular season, the No. 1 seed Garnet hosted the Centennial Championships for the second time in three seasons—and just like the last time the event was held at the College, Swarthmore walked away as the champion. In the semifinal match against Johns Hopkins, Philippe Celestin ’11—the hero from the 2009 postseason—netted a late game-tying goal and Swarthmore outlasted the Blue Jays in penalty kicks to reach the title match. In the final against Muhlenberg, it was more late-game heroics as Kieran Reichert ’13 scored in the 106th minute to win the championship. The Centennial title earned the Garnet an automatic berth to the NCAA Tournament and, in its first match against DeSales, Swarthmore once again came away with the cardiac victory. With the score tied 1-1 in the final minute of play, Fabian Castro ’12 scored the winning goal off an assist from Morgan Langley ’11 with 47 seconds remaining to send the Garnet to the second round. There the postseason came to an end. Upstart Medaille advanced past the Garnet in penalty kicks, marking the second consecutive season Swarthmore’s season ended with set-piece kicks. The catalyst for much of the 2010 season was Langley, who produced one of the greatest offensive seasons in Swarthmore soccer history. The senior from Hawaii set new program records for career points (95) and assists (27), leading the NCAA in assists, assists per game, and points per game for much of the season. Langley’s 42-point, 14-assist season (also records) was enough to earn him the honor of Centennial Conference Player of the Year, making him the first person in Garnet men’s soccer history to receive the honor. Langley was also named to the Centennial Conference First Team, where he was joined by teammates Castro and captain Micah Rose ’12. Rounding out the Garnet’s program record five selections were second-team selections captain Gage Newman ’11 and Pierre Dyer ’12. Off the field, junior goalkeeper David D’Annunzio was named the Philadelphia Inquirer Men’s Soccer Academic Performer of the Year. John McMinn ’13 (leading) was one of five sophomores who led the mens’ cross-country team to a fourth-place finish at the Centennial Championships. Building from a strong 2009 season, the Class of ’13 again paced the men’s cross-country team, leading the Garnet to a fourth-place finish at the 2010 Centennial Conference Championships and a 17th place finish at the NCAA Mideast Regionals. In the 8k regional race at Slippery Rock, the Garnet was led by John McMinn ’13 and Jacob Phillips ’13, who finished with times of 26:47.3 and 27:08.4 respectively, good for 62nd place and 76th place in a field of 316 runners. McMinn and Phillips also led the Garnet at the Centennial Championship meet, crossing the finish line in 21st (25:57.80) and 22nd place (25:58.30). At the Paul Short Invitational at Lehigh, four of Swarthmore’s top five finishers were sophomores, as McMinn, Phillips, Aidan Dumont-McCaffrey ’13, and Bill King ’13 all broke the top 40. For their efforts during the 2010 season, the Garnet finished the season in the Mideast regional rankings. Emma Saarel ’14 turned in an impressive rookie campaign as she teamed with Hannah Rose ’12 to lead the Garnet women’s cross-country team to a fourth-place finish at Centennial Conference championships and a seventh-place finish at the NCAA Mideast Regionals. Rose and Saarel both earned All-Region honors for their performances at the regional meet, where Rose came in 22nd (23:12) and Saarel 34th (23:34.1). At the Centennial Conference Championship meet hosted by Johns Hopkins, Saarel was the Garnet’s top finisher, coming in 13th (22:39) to earn second-team All-Conference honors. Saarel was trailed by Rose (22:50/16th), Becky Painter ’13 (23:10/20th), Rebecca Hammond ’13 (23:12/23rd), Isabel Newlin ’13 (24:08/35th), Caitlin Russell ’11 (24:15/38th), and Rebecca Woo ’11 (24:17/39th) at the Centennial meet. Saarel and Rose consistently placed in the Garnet top five, with both earning All-Championship honors in the 29th Annual Seven Sisters Race at Vassar with third- and 10th-place finishes, respectively. 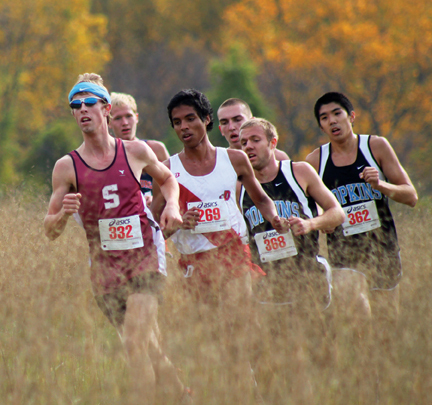 As a team Swarthmore spent nearly the entire season in the regional rankings and just missed out on a season-ending national ranking. Megan Colombo ’11 was the first women’s soccer player to be named Centennial Conference Player of the Year. She was also named NSCAA All-Region and the ECAC Division III South Region Player of the Year. Megan Colombo ’11 rewrote the Swarthmore women’s soccer record book in her final season and, thanks to her spectacular effort, became the first player in program history to be named Centennial Conference Player of the Year. The new Swarthmore women’s soccer all-time leader in career goals (31) and points (75), Colombo broke both records with the first of her three goals in a 5-0 victory of Bryn Mawr on Oct. 9. Colombo went on a tear midway through the season, scoring eight of her goals during a five-game winning streak that helped the team achieve its highest NCAA regional ranking ever. The Garnet women saw four players named to the All-Centennial Conference team. Colombo was named to the first team, Hannah Purkey ’11 made the second team, and Elizabeth Mills ’11 and Alexa Ross ’13 received honorable mention. 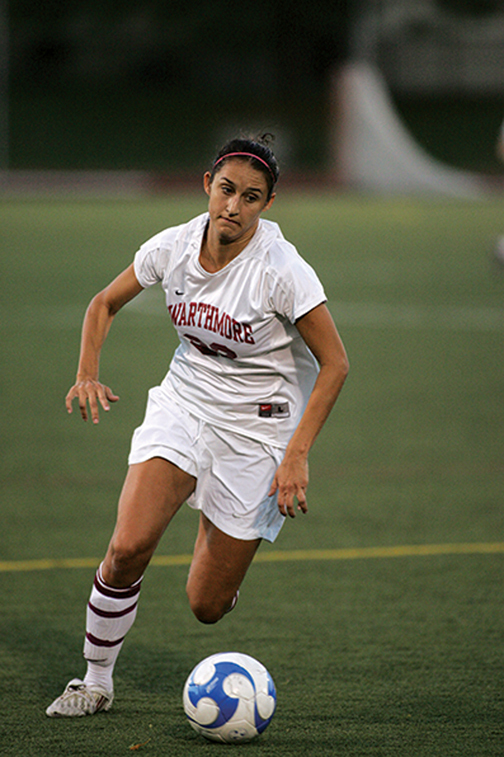 Purkey, whose second-team selection was the first of her career, started every game during her four years at Swarthmore. Mills helped anchor the Garnet defense, and Ross turned in a strong defensive season in the midfield to follow up her 2009 second-team selection. The Garnet finished the season with an 8-7-2 record, including a 6-4 mark in Centennial Conference play, just missing its fifth straight conference tournament appearance on a tie-breaker. The 2010 Swarthmore field hockey team turned in its most successful season since 2007, winning six games and tripling its Conference win total from the previous two years. Captain Sophia Ferguson ’11 had a breakout season, leading the Garnet in points (24) and goals (nine) while earning Second Team All-Centennial Conference honors. Sophia Agathis ’13 also turned in a strong season, leading the team with seven assists. Adding to the young team were the talents of Nia Jones ’14 and Aarti Rao ’14, both of whom wasted no time in making an impact and giving the Garnet plenty of hope for the future. Jones finished the season with eight goals and 14 points, and Rao scored three goals, added three assists, and provided solid midfield play throughout the year.